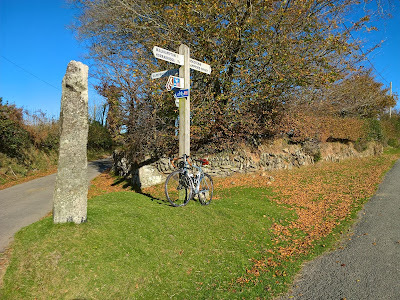 Down here in the Dartmoor area of Devon it is all ups and downs... You are either cycling uphill or going downhill...there are hardly any stretches of real flat roads at all. As if that wasn't enough the road that passes the campsite is part of a climb listed in Simon Warren's book '100 Greatest Cycling Climbs'. The climb can be found on page 31 of the book and is titled 'Rundlestone'.... Simon rates it as 7/10. Take care and I will be looking for your next post. That picture illustrates why many people feel that more than three gears are necessary! Trevor Gids ( Gideon Howe) here I have sent a message somewhere else in your blog. But can't find it. I've just seen that you are in Dartmore. We are in Devises from Saturday for a week. Not too far to catch up on old times. Find me or message me on Facebook if you want to catch up. Gids. It will be great to catch up on old times..